The Office of Rail Regulations has announced that it will investigate the handling of the National Rail Enquiries / My Rail Lite debacle that prompted fury from many iPhone users. 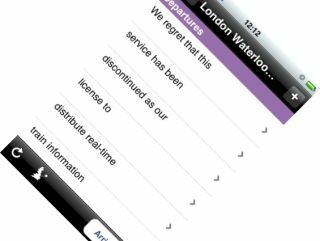 My Rail Lite – a popular and free application with some innovative features and live rail travel information - was told that it did not have a licence, just before a paid-for National Rail Enquiries app appeared. The decision was greeted with disgust by some, as TechRadar covered back in April. And it seems that this disgust bubbled over into complaints to the ORR, which is now investigating. "The reason we are investigating is that we suspect that NRE may have imposed some unfair terms on third parties," a spokesman told Shane Richmond on his Telegraph blog. "I know we've received several complaints from people with iPhones." The statement from the ORR reads: "The Office of Rail Regulation (ORR) is investigating the supply of Real Time Train Information (RTTI) by National Rail Enquiries Service Ltd (NRE). NRE is the official information service for National Rail and is owned by the Association of Train Operating Companies (ATOC). "RTTI is a key input into the provision of live train running information to passengers through media such as train information websites or services accessed over mobile phones. "We are conducting this investigation under the Competition Act 1998 (the Act), having been made aware of concerns in this area including from members of the public, and from Members of Parliament on behalf of their constituents. "The opening of an investigation under the Act does not necessarily mean that we will make a finding of an infringement. Another outcome of our investigation might be that no infringement has occurred."